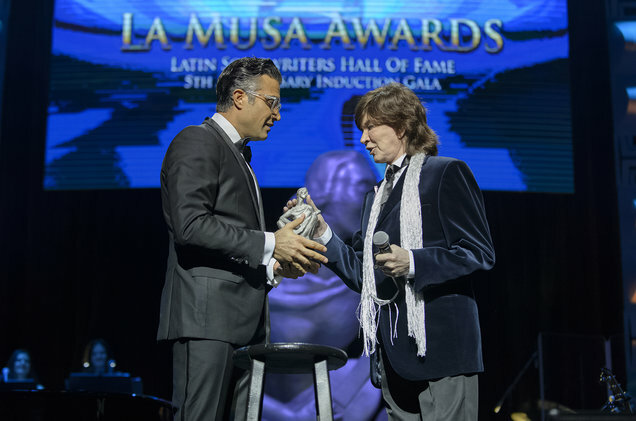 At the fifth annual La Musa Awards gala — hosted by Jane the Virgin’s Jaime Camil — Erika Ender, Ana Gabriel, Roberto Livi, Martin Urieta, Carlos Vives and Camilo Sesto were inducted into the prestigious Latin Song Writers Hall of Fame. Each was presented at the James L. Knight Center with the coveted hand-crafted trophy, originally inspired by “the muse” of the late Cuban songwriter and poet, Elena Casals. Additionally, Vives was presented with the Icon Award, while Wisin, the late Julio Jaramillo and “La Bamba” garnered the Victory Award, Legacy Award and Song of All Time, respectively. Amid a political climate currently riddled with anti-immigrant rhetoric, as well as the devastating aftermaths of hurricanes Irma and Maria throughout the Caribbean, Urieta offered words and sentiments in support of immigrants, while Ednita Nazario performed a brilliant tribute to the island of Puerto Rico.